We are pleased to announce the release of Recital 10.0.3. Here is a brief list of features and functionality that you will find in the 10.0.3 release. - DO level increased from 32 to 64. This article discusses Recital database security: from operating system file permissions through file and field protection to DES3 encryption. A company's data is extremely valuable and must be protected, both in operation and in physical file format. Recital products provide a range of ways to protect your data. The most basic level of database security is provided by the operating system. Recital database tables and indexes are individual files with their own respective operating system file permissions. Read permission is required to open a table and write permission to update a table. If a user does not have read permission they are denied access. Without write permission, a table will be opened read-only. Here the owner, root, and members of the recital group have write permission, so can update the example table unless additional protection applies. Other users can only open the example table read-only. Each Recital table may have a Database Dictionary. The Dictionary can be used both to protect the integrity of the data and to protect access to the data. This section covers Column Constraints, Triggers, Security and Protection. The Dictionary attributes or constraints either prevent the entry of incorrect data, e.g. must_enter and validation or aid the entry of correct data, e.g. default, picture and choicelist. The Dictionary can be modified in the character mode CREATE/MODIFY STRUCTURE worksurface, via SQL statements, or in the Recital Enterprise Studio Database Administrator. Fig 1: MODIFY STRUCTURE Worksurface: Dictionary. Used to auto increment the value of a column. Used to calculate the value of a column. Used to validate a change to the value of a column. Used to set a default value for the specified column. Used set the column description for the specified column. Used to define an error message to be displayed when a validation check fails. Used to define a column as a Foreign Key for a parent table. Used to prevent code page translation for character and memo fields. Used to disallow/allow NULL values. Used to define a tables Primary Key. Used to specify minimum and maximum values for a date or numerical column. Used to force recalculation of calculated columns when a columns value changes. Used to create a relationship to an index key of another table. Fig 2: Database Administrator: Column Constraints and Attributes. Table Level Triggers are event-driven procedures called before an I/O operation. These can be used to introduce another layer of checks before a particular operation is permitted to take place or to simply set up logging of those operations. The CREATE/MODIFY STRUCTURE worksurface <TRIGGERS> menu bar option allows you to specify table level triggers. You may edit a trigger procedure from within the <TRIGGERS> menu by placing the cursor next to the procedure name and pressing the [HELP] key. A text window pops up for editing. If the table triggers are stored in separate <.prg> files, rather than in a procedure library, procedures need not be predefined (SET PROCEDURE) before using the table. Fig 3: MODIFY STRUCTURE Worksurface: Triggers. The following triggers can be selected and associated with a specified procedure name in the <TRIGGERS> menu. The specified procedure is called prior to an update operation on the table. If the procedure returns .F., then the UPDATE is canceled. The specified procedure is called prior to a delete operation on the table. If the procedure returns .F., then the DELETE is canceled. The specified procedure is called prior to an append operation on the table. If the procedure returns .F., then the APPEND is canceled. The specified procedure is called after an open operation on the table. The specified procedure is called prior to a close operation on the table. The specified procedure is called when a user presses the [ABANDON] key in a forms based operation. The Recital Enterprise Studio Database Administrator also allows you to associate existing programs as Table Trigger Procedures. Fig 4: Database Administrator: Triggers. The specified procedure is called prior to an insert operation on the table. If the procedure returns .F., then the INSERT is canceled. As mentioned above, all Recital files are subject to Operating System read and write permissions. These permissions can be further refined, while still using the Operating System user and group IDs, in the Security and Protection sections of the Dictionary. 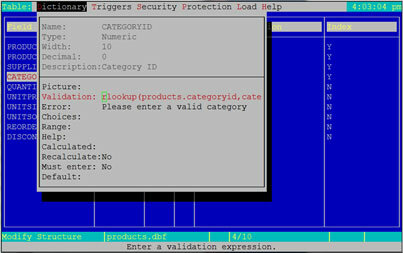 The Security section handles table based operations and the Protection section focuses on individual fields. Security and Protection rules can be defined in the CREATE/MODIFY STRUCTURE worksurface of Recital Terminal Developer, via the SQL GRANT and REVOKE statements or in the Recital Enterprise Studio Database Administrator. Fig 5: MODIFY STRUCTURE Worksurface: Security. The Security section has table operations for which Access Control Strings can be specified. An Access Control String (ACS) is a range of valid user identification codes, and is used to restrict table operations to certain individuals or groups. Each user on the system is allocated a group number and a user number. The user identification code is the combination of group and user numbers. When constructing an Access Control String of linked user identification codes, wild card characters may be used. Please note that the maximum ACS length is 254 characters. OpenVMS group and user numbers are stored and specified in octal. On other Operating Systems, group and user numbers are stored and specified in decimal. Users specified in the ACS have read-only access to the table. All other users have update access. Users specified in the ACS have update access to the table. All other users are restricted to read-only access. Users specified in the ACS can append records into the table. No other users can append. Users specified in the ACS can delete records from the table. No other users can delete. Users specified in the ACS can copy records from the table. No other users can copy. All other users cannot, except the creator of the table, who is always granted ADMIN access. Users specified in the ACS may name any column in a SELECT statement. All other users have update access. Users specified in the ACS may name any column in an UPDATE statement. All other users are restricted to read-only access. Users specified in the ACS can INSERT rows into the table. No other users can INSERT. Users specified in the ACS can DELETE rows from the table. No other users can DELETE. Users specified in the ACS can use the ALTER TABLE statement on this table. Users specified in the ACS may read any column in a SELECT statement. All other users have update access. Fig 6: Database Administrator: Protection. Users specified in the ACS have read-only access to the field. All other users have update access. Users specified in the ACS have update access to the field. All other users are restricted to read-only access. Users specified in the ACS see the 'hiddenfield'character rather than the data in the field. All other users see the data. Hidden fields can be accessed and viewed on a work surface, but the field contains the hiddenfield character, ?. If the field is referenced in an expression, it will contain the following: blanks for character fields, F for logical fields, 00/00/0000 for date fields and blank for memo fields. Users specified in the ACS may name the column in a SELECT statement. All other users have update access. Users specified in the ACS may name the column in an UPDATE statement. All other users are restricted to read-only access. Users specified in the ACS may read the column in a SELECT statement. All other users have update access. From Recital 8.5 onwards, Recital installations that have the additional DES3 license option have the ability to encrypt the data held in Recital database tables. Once a database table has been encrypted, the data cannot be accessed unless the correct three-part encryption key is specified, providing additional security for sensitive data. The ENCRYPT Recital 4GL command is used to encrypt the data in the specified table or tables matching a skeleton. If the skeleton syntax is used, then all matching tables will be given the same encryption key. The encryption key is a three part comma-separated key and may optionally be enclosed in angled brackets. Each part of the key can be a maximum of 8 characters. The key is DES3 encrypted and stored in a .dkf file with the same basename as the table. After encryption, the three parts of the key must be specified correctly before the table can be accessed. If a database table is encrypted, the correct three-part encryption key must be specified before the table's data or structure can be accessed. The SET ENCRYPTION TO set command can be used to specify a default encryption key to be used whenever an encrypted table is accessed without the key being specified. The encryption key is a three part comma-separated key. If the command to access the table includes the key, either by appending it to the table filename specification or using an explicit clause, this will take precedence over the key defined by SET ENCRYPTION TO. Issuing SET ENCRYPTION TO without a key causes any previous setting to be cleared. The key must then be specified for each individual encrypted table. The default key defined by SET ENCRYPTION is only active when SET ENCRYPTION is ON. SET ENCRYPTION OFF can be used to temporarily disable the default key. The SET ENCRYPTION ON | OFF setting does not change the default key itself. SET ENCRYPTION is ON by default. The DECRYPT command is used to decrypt the data in the specified table or tables matching a skeleton. The specified key must contain the three part comma-separated key used to previously encrypt the table and may optionally be enclosed in angled brackets. The skeleton syntax can only be used if all tables matching the skeletonhave the same key. The DECRYPT command decrypts the data and removes the table’s .dkf file. After decryption, the key need no longer be specified to gain access to the table. Used to append records to the active table from another table. Used to copy a file. Used to copy a table's structure to a new table. Used to copy a table. copy to newcustomers encrypt "newkey_1,newkey_2,newkey_3"
copy to encorders encrypt "newkey_1,newkey_2,newkey_3"
Used to display a directory listing of tables. 0.765 MB in 11 files. 1.093 GB remaining on drive. Used to open a table. // encrypted table. All of the following are valid. Used to add a row to a table via SQL. Used to return data from a table via SQL. Used to update data in a table via SQL. Recital offers a range of ways to keep your data secure. These start with the Operating System read/write permissions, which can be further refined to the level of table I/O operations and then field access in the Dictionary based Security and Protection rules. The Dictionary also provides the means to protect the integrity of the data via data validation and to assist in correct data entry through the use of choicelists, help messages and picture clauses etc. A further role of the Dictionary is in the provision of Table Triggers, which can be used to enable a programmatic response to table operations to add in additional checks or audit trails. For the most sensitive data, DES3 encryption is the ultimate protection: encrypting the physical data on the disk and only permitting table access on the production of the three part encryption key. Each Recital table can have one or more data dictionaries to provide a central repository for constraints and other metadata. Here's how to set up field validation based on dynamic values from another table. Using the products.dbf table from the southwind sample database, validation can be added to the categoryid field to ensure it matches an existing categoryid from the categories.dbf table. The rlookup() function checks whether an expression exists in the index (master or specified) of the specified table . An attempt to update categoryid with a value not in the list will give an error: Validation on field 'CATEGORYID' failed. If you have access to the Recital Workbench, you can use the modify structure worksurface to add and alter your dictionary entries, including a customized error message if required.